In the Fed's latest Flow of Funds report released at noon today, the US central bank released the latest snapshot of the US "household" sector as of Sept 30, 2018. What it revealed is that with $124.9 trillion in assets and a modest $15.9 trillion in liabilities, the net worth of US households rose to an all time high $109 trillion, increasing for 12 consecutive quarters and up $2.1 trillion as a result of an estimated $245 billion increase in real estate values, as well as a $1.9 trillion increase in various financial assets like corporate equities, mutual and pension funds, and deposits as the market soared to just shy of new all time highs in the second quarter, even if it needed some time in Q3 to reach a new record just days before the quarter ended. 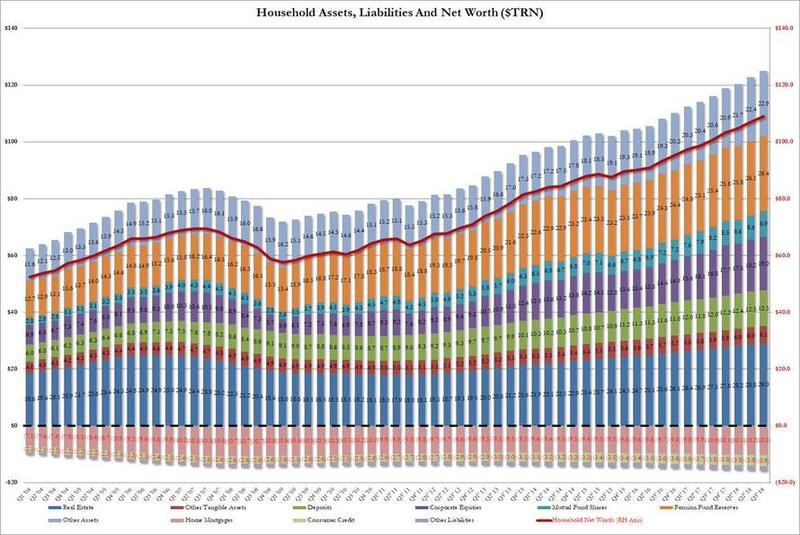 Total household assets in Q2 rose $2.3 trillion to $122.7 trillion, while at the same time total liabilities, i.e., household borrowings, rose by only $132 billion from $15.6 trillion to $15.7 trillion, the bulk of which was $10.2 trillion in home mortgages.Homeowners’ real estate holdings minus the change in mortgage debt rose by $320.1 billion (a positive number means that the value of real estate is growing at a faster pace than household mortgage debt). 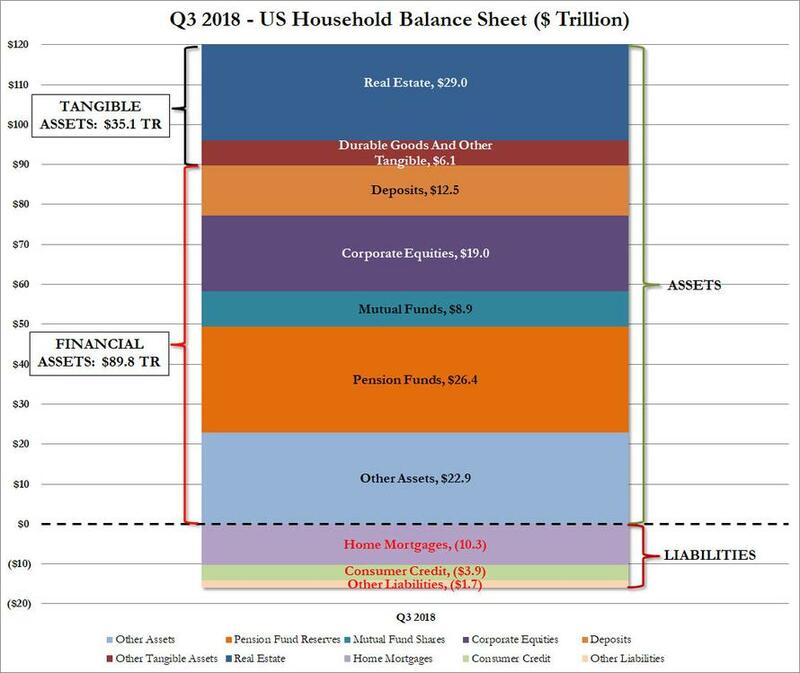 The breakdown of the total household balance sheet as of Q3 is shown below. 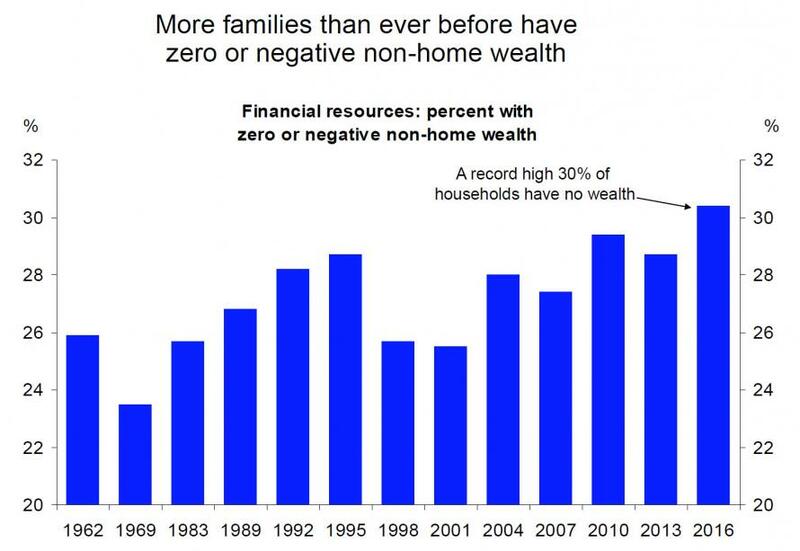 And while it would be great news if wealth across all of America had indeed risen as much as the chart above shows, the reality is that there is a big catch: as shown previously, virtually all of the net worth - most of it in the form of financial assets - and associated increase thereof, has only benefited a handful of the wealthiest Americans. In other words, roughly 75% of the $2.2 trillion increase in assets went to benefit just 10% of the population, who also account for roughly 76% of America's financial net worth. 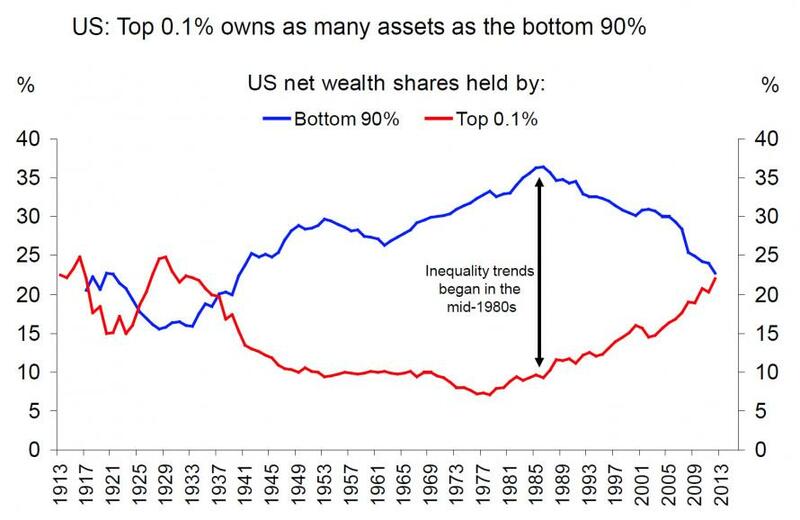 And there - as we say quarter after quarter - is your "recovery": the wealthy have never been wealthier, while half of America, some 50% of households, own just 1% of the country's wealth, down from 3% in 1989. Finally, America's poor have never been more in debt.